This decorative vase from Nicaragua is 6 inches tall and 5.5 inches in diameter, featuring a lovely emerald turtle design. This is low fired and not designed to hold water. 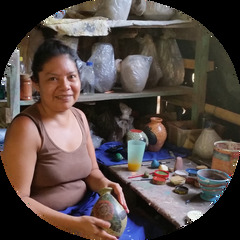 Pictured above is Darwin Calero, a ceramicist from San Juan de Oriente. He learned to make ceramics from his parents. Darwin has two children and works with his wife in their house made out of black plastic.